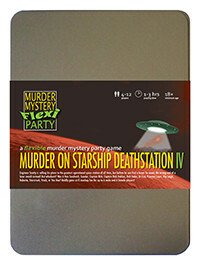 You've been invited to play the role of Goader in Murder on Starship Deathstation IV. The infamous Engineer Snotty has just finished the plans for the greatest operational space station of all time, and now he’s invited all sorts of scum and villainy from the across the galaxy to bid for them. But before the auction can begin, Snotty is found in pieces, literally, on the wrong end of a laser-sword! Can you boldly go and find his killer before they strike back again?! GOADER is a sauce master! Must haves for his ensemble include a withered stick, green face paint, a smock and a bottle of sauce of your choice (or laser-sword) He’s very short, so if you’re not, try reinforcing your knees and hobbling around on them! truthfully almost every food tastes better with sauce. I am Goader. The ways of the sauce, I teach. Young I was, when great illness struck. Tall I was, until squashed by a truck. Get the plans, I would. Else, fall into the wrong hands, they will. Understand me, you will. Little breath have I. Vertically challenged I am. Snotty kept the plans on a high shelf, see I could not. The sauce is no good in this one.